Nuestra Gente is a community newspaper serving the greater Inland Empire and the San Gabriel Valley in California. Features include community events, classified advertisements, display advertisements, recipes, personals and more. 210 is San Antonio's free weekly guide to entertainment, culture, dining, nightlife, bars, clubs, sports, fitness, news, video blogs, podcasts and more. 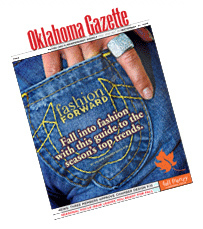 The Oklahoma Gazette is a free weekly paper distributed throughout Oklahoma City. It covers statewide news dealing with topics such as theater, music, and sports. SB Magazine is a monthly glossy consumer publication of the Shreveport-Bossier area in northwest Louisiana. The magazine covers a wide spectrum of community topics. Figures from the first half of 2008 showed the USPS had a fiscal year-to-date net loss of $1.3 billion. Postal experts predict that the next rate hike will almost certainly come in May 2009. The increase will hit publishers who use mail delivery hard. Most free community publications and TMC products rely on Standard Mail for delivery. 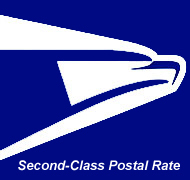 They pay higher postal rates and sometimes experience slower service than Periodical Mail. Some free publications are looking to switch to Periodical Mail to help trim postal costs to ease stretched budgets. By becoming free "requester" publications, they can realize as much as a 40% savings off Standard Mail rates. Generally, mail delivery is still cheaper than motor-route delivery for lower-weight publication due to the high cost associated with maintaining a carrier workforce (hiring, training, payroll, etc.) and the high cost of gas. However, even small postal rate hikes may severely impact small publishers' bottom line. Publish on a regular (and stated) frequency, no less than 4 times per year. 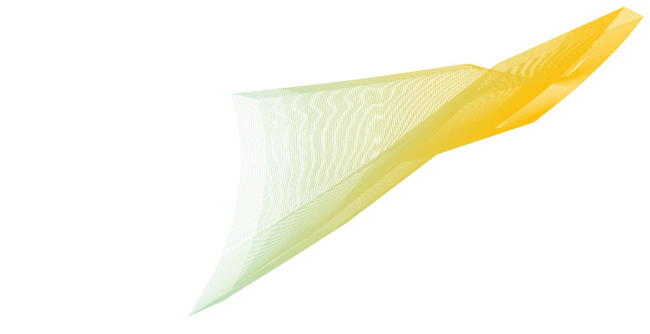 Meet mailability and preparation standards set forth in the DMM. Not contain more than 75% advertising in any one issue. Contain a minimum of 24 pages. Maintain a minimum of 50% + 1 requester versus non-requester copies. Keep requester file current. Requesters are valid for 3 years, then their status expires and must be requalified. Are not owned or controlled by one or more individuals or business concerns and conducted as an auxiliary to and essentially for the advancement of the main business or calling of those who own or control the publication. Since the 1970s, all classes of mail have been required to cover the costs associated with their delivery. However, periodicals have enjoyed the privilege of not being required to cover the overhead costs or the postal infrastructure, employees, etc. This tradition dates back to the founding fathers who endorsed the idea that only informed voters could have a true democracy. George Washington actually supported mailing newspapers for free. Publishers looking to obtain periodicals mailing privileges have to weigh the benefits of lower postal rates and better service against the costs and challenges associated with obtaining it. In addition to the $510 initial application fee (USPS 3500), publishers also have to pass a postal audit to determine if they meet the qualifications for periodicals mailing privileges and periodic audits as well. The review may be long and intrusive. Publishers have also run into trouble with the USPS guidelines regarding qualifying telemarketing and Internet orders. There are significant costs associated with maintaining a requester database as well. In most cases, publishers need to either purchase an in-house fulfillment system or use an outside fulfillment house to manage their database. Over and above the costs of the original campaign to build the requester file, there are ongoing costs associated with servicing and requalifying subscribers every three years. Some mass-market publications have found success by reaching a niche audience. By targeting common interests, such as alumni magazines or bridal magazines, they are able to deliver a fairly focused audience. The value proposition community newspaper publisher's must ask themselves when considering moving to a requester model is whether a smaller, defined circulation is more valuable to advertisers than a larger more diverse one. According to a survey from the Association of National Advertisers (ANA), 53% of marketers expected their advertising budgets to be reduced in the next six months by between 1 to 10%. The survey, conducted this summer, sampled a broad cross-section of categories and industries. Eighty-seven percent of those polled were already being asked to find savings within current marketing and advertising programs. While this information may look gloomy for media, there are some bright spots. A survey conducted in August 2008 by the Kelsey Group reported that, according to the latest wave of the Local Commerce Monitor of SMB advertising behaviors, 81% of SMBs surveyed expect to maintain (47%) or increase (34%) their spending on advertising over the next 12 months, with only 9% planning to decrease ad spending. Media needs to encourage advertisers to spend their ad budget better, not less. Advertisers should concentrate ad dollars on the areas of known marketing effectiveness–the tried and true sources of business–to yield even better results. Identify the "must haves" and focus on those channels. 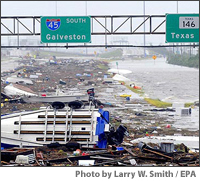 Stephen Marshall, Director of Research and Consulting at The Kelsey Group, said, "There's an opportunity for media that can demonstrate ROI to tap into SMBs' future advertising plans..."
Verified Audit Circulation is saddened by the loss of life and destruction of property in the wake of Hurricane Ike. During this difficult time, we would like to offer our sympathy and support to our clients. We appreciate the tremendous amount of money, effort, and time required to restore the affected areas. Subscribers living in areas where USPS delivery is not possible. Subscriptions can be extended once service is resumed. The interruption in service will not be considered noncontinuous. Distribution to suspended subscribers will not be included in paid/nonpaid qualified circulation. 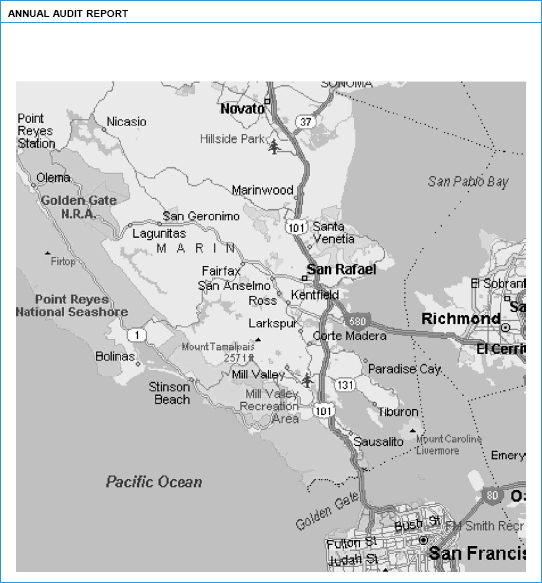 Subscribers living in areas where carrier delivery is not possible. Subscriptions can be extended once service is resumed. The interruption in service will not be considered noncontinuous. Locations (target/bulk, carrier, racks and dealers) in areas where delivery is not possible. The interruption in service will not be considered noncontinuous. Publishers will be given the opportunity to provide explanation in their Audit Report and Publisher's Statement regarding the impact of the disaster on their distribution. Clients affected by the disaster are permitted a one-month extension on reporting their September Quarterly Printing and Distribution Report (QPD). The new required reporting date for those clients is November 15, 2008. QPDs will not be considered past due until after that date. All field surveys will be temporarily suspended in the affected areas for at least one month. In addition, clients may use the omitted days guidelines to cover the period when distribution was not possible. These days will not be included in the QPD averages. Please see the Information and Resource Guide to get information about the allowable omitted days. Please call Verified at 415-461-6006 if you have any further questions. According to a new report by the Online Publishers Association, local media sites hold a distinct advantage when it comes to delivering results for advertisers. The study finds that consumers trust advertising on local newspaper, magazine, and television websites, and are very likely to take action after viewing ads on these sites. Newspapers rank first, with 46% of consumers taking action, including making a purchase, going to a store, or conducting research after viewing a local ad as compared to 37% of consumers acting after viewing a local ad on a portal. OPA President Pam Horan says "Local media sites deliver concrete results for local advertisers...consumers are more likely to act on the ads they see on local TV, newspaper, and magazine sites." The report concludes that consumers on these sites are desirable advertising targets. Local magazine, newspaper, and TV sites attract significant percentages (48%, 40% and 39%, respectively) of consumers who spent more than $500 online in the past 12 months. Thirty-seven percent of portal visitors and 34% of the overall online population spend this amount in a year. Consumers express significant faith in advertising on local content sites. Newspaper sites lead the way, with 56% of visitors expressing strong trust of the advertising found on these sites, followed by local TV station sites and portals. The OPA report finds that satisfaction with local content is high overall, and portals and media sites each have strengths. 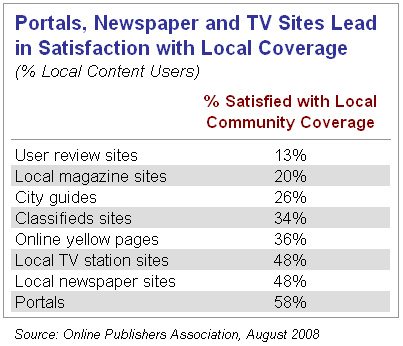 Portals lead in satisfaction among all local content visitors, followed by local newspaper and TV station sites. 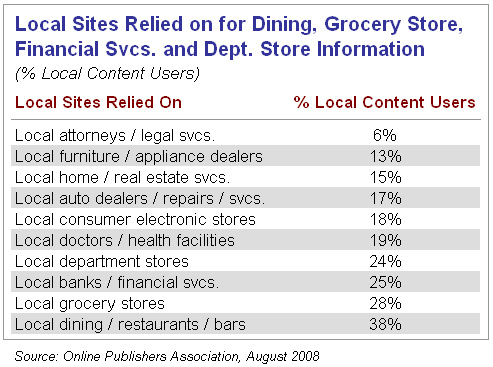 "Local content sites of all types play an important role in serving the local community. But this report shows that local media sites have a very real advantage when it comes to delivering results for advertisers," Horan said. 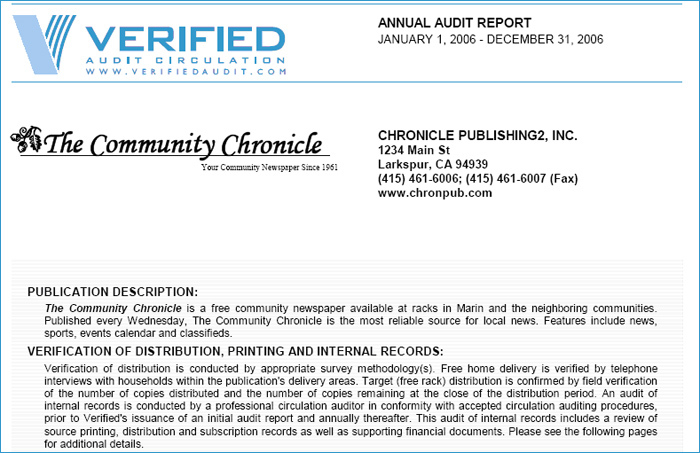 Your Audit Report and Publisher's Statement provide a wealth of information. Understanding the sections of the report is vital to successfully using it as a selling tool. The report can generally be divided into five main sections. Provides information about the type of report, the period covered by the report, logo, contact information, publication description/field served, and a brief description of the methodology used to conduct the audit. Provides information regarding the individual masthead including publishing frequency, period covered by the report, and name. It also provides a breakdown of circulation by category for both free and paid publications. This section also provides average press run, a history of qualified circulation and the basic price for both single copy and subscriptions. Provides geographic analysis of circulation for a single issue including ZIP/Postal Code, community name and the number of copies distributed in each ZIP/Postal Code. With a publications circulated over a large area, states or provinces may be used instead. 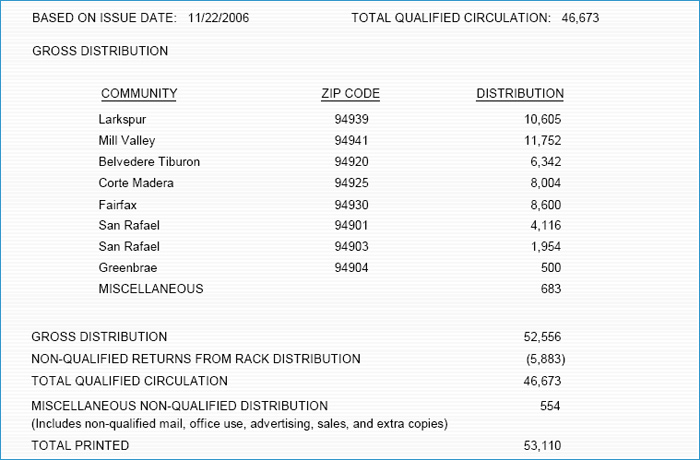 For publications who have an individual carrier or mail circulation, additional demographic data (ESRI) is provided. A map provides a visual snapshot of the circulation area. This is optional on the report. 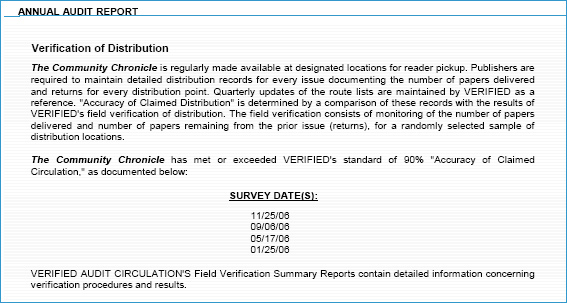 If field verification and/or a readership survey are conducted for the audit, the results and the methodology are provided here. Provides a brief description of the methodology used to conduct the audit and a sworn statement of the accuracy of the information included in the report.